Edge to edge quilting is our most popular and cost effective way to turn your quilt tops into beautiful heirlooms. To estimate cost for edge to edge quilting, multiply the width of your quilt by length (in inches). The result is your total square inches. Then multiply that number by .02. Batting is additional. Example: Your quilt top measures 66" wide and 86" long. 66 x 86 = 5676 square inches. Hand sew the binding to the back of your quilt: $0.10 per linear inch. 1. Lay your quilt out flat. 2. Measure the (vertical) length of the quilt IN THE CENTER of the quilt, DO NOT MEASURE THE LENGTH BY MEASURING THE EDGES. 3. Cut your border pieces to this measurement, and apply your borders. 5. Cut your border pieces to this measurement, and apply your borders. 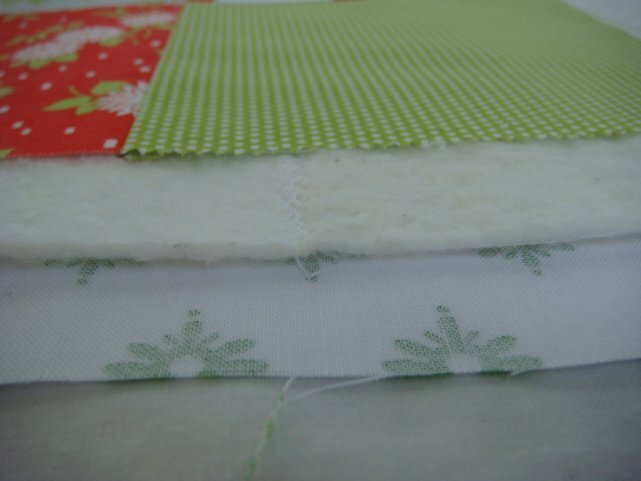 Please do not simply lay your border fabric on your quilt top and sew, then trim off the excess. This will result in waves or a ruffle effect. We have a large selection of high quality affordable batting by Quilters' Dream. Check out the varieties here. Turnaround time 6-10 weeks. Please call 239-995-0045 for estimated delivery times. PLEASE be sure that your backing fabric and your batting are both 4-6 INCHES BIGGER than your quilt top ON ALL SIDES. Please press your quilt top and all seams, as well as your backing. How much Fabric Do I need for Binding? Divide X by 40 inches. [(70 x 2) + (60 x 2)] + 20 = 280 linear inches. 280 divided by 40 inches (standard width of fabric) = 7 strips of fabric. If you use 2.5 inch binding, then 7 x 2.5 = 17.5 inches, which is about 1/2 yard.